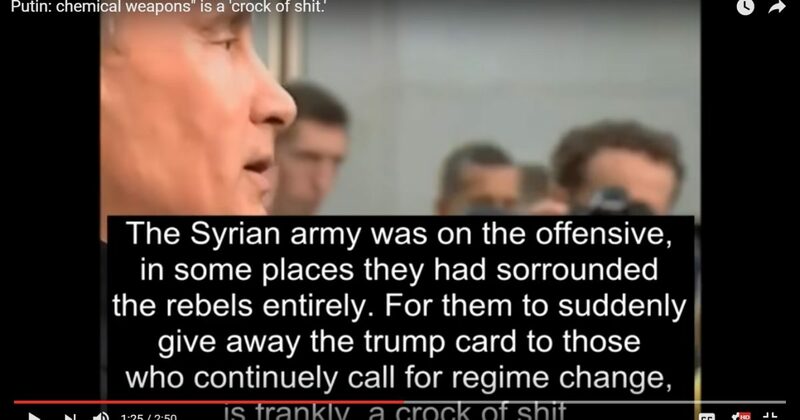 VIDEO: Putin says US attack on Assad is based upon “a crock of sh!t.” He is right! I am not going to regurgitate the many reasons that we (Trump) really stepped in it this time. I have said it over and over for the past several days. Now, Putin has a nuclear-armed warship heading to the Med while Tillerson is giving Putin an ultimatum – choose Assad or the United States. I believe that Putin and Assad are right, and Putin will never choose a country (US) that bombed a sovereign ally without at least allowing an investigation into exactly what happened. We are waaaaaaaaaaaay on the wrong side of this.